Zylstra caught one of two targets for 23 yards in 16 games this season. Analysis: Zylstra also returned one kick for 15 yards and returned four punts for 26 yards as he saw more than one offensive snap in only three games in 2018. 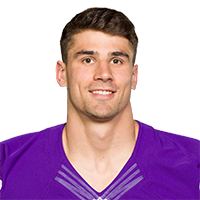 The former CFL wide receiver will look to gain an increased offensive role in 2019 as the Vikings received little production at wide receiver behind top targets Stefon Diggs and Adam Thielen. Zylstra (undisclosed) is active for Sunday's game against the Patriots. Analysis: Zylstra was initially listed as questionable for Sunday's tilt against the Patriots, but will ultimately suit up without issue. He's expected to take most of his snaps on special teams. Zylstra is listed as questionable for Sunday's Week 13 game against the Patriots with an undisclosed injury, Andrew Krammer of the Minneapolis Star Tribune reports. Analysis: Zylstra has been handed the questionable tag, but he isn't actually listed with an injury. The 25-year-old has played eight offensive snaps this season, so the Vikings offense is unlikely to impacted by the 25-year-old's uncertainty for Sunday. Zylstra had one reception for 23 yards on his only target in Sunday's win at the Jets. Analysis: It was his first career reception, as he got some playing time amid a blowout win. He's spending almost all his time on special teams and isn't likely to get many more receptions unless a few receivers ahead of him on the depth chart are injured. Still, the former Canadian Football League star could be someone to watch in the future after he garners some additional NFL experience. Zylstra has made Minnesota's 53-man roster, ESPN 1500 am Twin Cities reports. Analysis: Zylstra led the CFL with 1,687 receiving yards on 100 receptions to go along with five touchdowns last season as a member of the Edmonton Eskimos. He'll likely see almost all of his action on special teams. Zylstra had four receptions for 54 yards and a touchdown in Thursday's preseason win over Tennessee. Analysis: Zylstra missed time in the preseason with a hamstring injury and finally got significant playing time. However, he still may not win a final roster spot and is more likely a practice squad candidate. Zylstra played in Friday's preseason win over Seattle, but was not targeted in the passing game. Analysis: Zylstra missed the previous preseason game with a hamstring injury. His injury may have him behind in the competition for the final few reserve receiver roles with Stacy Coley and Chad Beebe having strong preseasons. Zylstra (hamstring) was a participant at Tuesday's practice, Courtney Cronin of ESPN.com reports. Analysis: Zylstra took second-team reps during the practice session. He has been hampered by a hamstring issue all camp, which has not helped him in his pursuit for a spot on the final roster. Health permitting, he will look to impress during the Vikings' final two exhibition contests. Zylstra (hamstring) is not expected to play in Saturday's preseason game, the team's official web site announced. Analysis: Zylstra returned to practice this week, but the Vikings are going to hold him out of game action another week. Unfortunately that will give him just two games to try and win a roster spot. Zylstra, who has dealing with a hamstring injury, was seen practicing in pads Thursday, Andrew Krammer of the Minneapolis Star Tribune repots. Analysis: While it's been revealed that Zylstra has been nursing a hamstring injury, it also looks like he's close to being back to full health. It's yet to be seen whether he will be healthy enough to play in Saturday's preseason game, but if Zylstra is able to practice again Friday, there's a good chance he makes his preseason debut. Zylstra (undisclosed) is not expected to play in Saturday's preseason game at Denver. Analysis: The former Canadian Football League player has had a strong camp and may have a lead on a final roster spot. However, he'll sit out this game with what is reportedly a minor injury. Zylstra is recovering from an undisclosed injury suffered in practice Wednesday and might not play in Saturday's preseason game at Denver, the Minneapolis Star Tribune reports. Analysis: The former Canadian Football League player has had a strong camp and looked likely to be featured early in the preseason as he competed for a reserve role. The report says the injury is thought to be minor, but the Vikings may still play it safe. The report also says he's likely to win a spot on the final roster. There are no videos available for Brandon Zylstra. Click here to view all videos.